Negus, D. and Taylor, P. W. (2014). Accelerated Storage Stability Testing of a Potential Anti-Anthrax Therapeutic, EnvD. Bio-protocol 4(21): e1281. DOI: 10.21769/BioProtoc.1281. The purpose of stability testing is to determine how the properties of a particular therapeutic vary with time under the influence of specific environmental factors. Information regarding the long-term stability of therapeutics can be extrapolated by performing an accelerated storage stability study. Here, we describe an accelerated storage stability study for the potential anti-anthrax therapeutic, EnvD, a poly-γ-D-glutamic acid (PDGA) depolymerase. Storage conditions were based on those recommended by the International Conference on Harmonisation of Technical Requirements for Registration of Pharmaceuticals for Human Use (ICH). Owing to the high-molecular-weight and associated viscosity of PDGA in solution, loss of enzyme activity on storage can be determined as a reduction in the capacity of the depolymerase to reduce the viscosity of the polymer. This work supported by a Medical Research Council Capacity Building Studentship award. 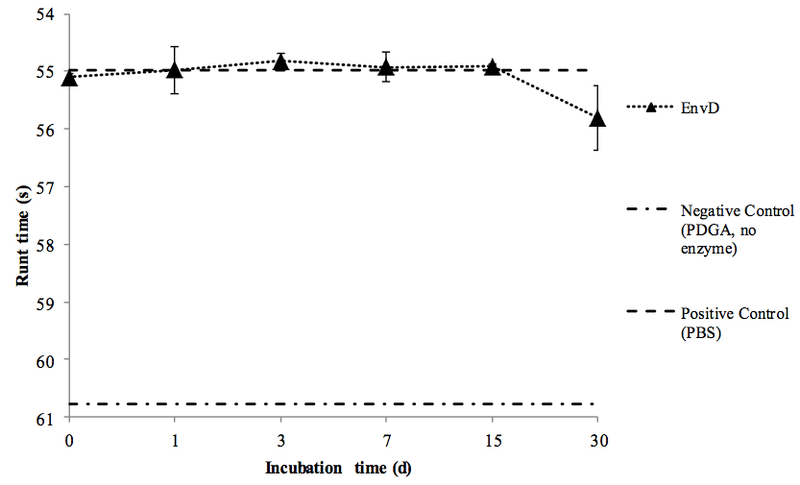 Aliquots of freshly isolated EnvD (35 µg total protein) were adjusted to a final volume of 50 µl with sterile PBS in 1.5 ml microcentrifuge tubes and sealed with Parafilm. Microcentrifuge tubes were maintained at 37 °C over a period of 30 days to simulate long-term storage. The temperature of the incubator was periodically checked to ensure it did not fluctuate by more than ± 2 °C. Samples of EnvD were periodically (0 days, 1 day, 3 days, 7 days, 15 days, 30 days) removed from the incubator and rapidly combined with 400 µg of lyophilised PDGA substrate suspended in 1 ml of PBS. Reactions were allowed to proceed for 1 h at 37 °C in a static incubator and were terminated by heating at 95 °C for 10 min. Samples were stored at -20 °C before viscometeric analysis. Viscosity of PDGA following incubation with stored enzyme preparations was determined using an Anton Paar falling ball microviscometer. Frozen samples were thawed at room temperature and transferred to a glass viscometry capillary containing a solid steel ball using a 5 ml syringe and filling adapter. Viscosity was determined as the time taken for the ball to fall 25 cm through the sample at an angle of 15° to the horizontal; each automated, timed determination was performed four times. After each reading the capillary was cleaned with distilled water followed by 70% ethanol. The capillary was then dried with compressed air. Figure 1. Stability of rEnvD during accelerated storage at elevated temperature. Samples of rEnvD were maintained at 37 °C for 30 d. At the time points indicated, aliquots were combined with PDGA (400 μg/ml), incubated for 1 h at 37 °C and the rune time determined. Ball run time (s) was measured in an Anton-Paar AMVn viscometer; the time taken for the ball to fall 25 cm at an angle of 15° to the horizontal was determined. Error bars represent ± 1 SD (n=8). This work supported by a Medical Research Council Capacity Building Studentship award. Kimura, K. and Itoh, Y. (2003). Characterization of poly-gamma-glutamate hydrolase encoded by a bacteriophage genome: possible role in phage infection of Bacillus subtilis encapsulated with poly-gamma-glutamate. Appl Environ Microbiol 69(5): 2491-2497. Negus, D. and Taylor, P. W. (2014). A poly-gamma-(D)-glutamic acid depolymerase that degrades the protective capsule of Bacillus anthracis. Mol Microbiol 91(6): 1136-1147. How to cite: Negus, D. and Taylor, P. W. (2014). Accelerated Storage Stability Testing of a Potential Anti-Anthrax Therapeutic, EnvD. Bio-protocol 4(21): e1281. DOI: 10.21769/BioProtoc.1281.